I'm not sure if I understood your question correctly. 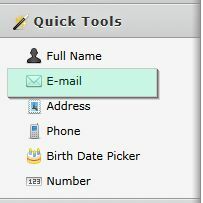 I guess you're looking for a way to insert an email textbox in your form. Unfortunately, I cannot see juantel\'s reply but when I saw the question earlier and checked his account, I think the lone form there already had an email field. This is just a wild guess but after doing a bit of Googling about checkboxes in emails, I think what juantel wants is a way to send a survey form containing such elements to a user\'s email address. The recipient would then be able to complete the survey and submit it right from her inbox. I suppose a user would first have to complete a regular form and according to the answers given, would receive the survey form in the autoresponse. Juantel, if this is the sort of thing you were thinking about, to the best of my knowledge, JotForm does not provide that capability. However if this what you were asking about, your idea will be forwarded to the developement team.